The cellular proteostasis network integrates all signals controlling protein synthesis, folding, trafficking, and clearance machineries in multiple subcellular compartments to maintain the integrity of the proteome and to ensure the survival of cells and tissues under varying proteotoxic insults. We here review the proteostasis network that controls the adaptation of the ubiquitin proteasome system (UPS) to cellular demands and its perturbations in autoinflammation. Proteotoxic stress of various physiological origins such as inflammation can be typically counteracted by the shut-down of global protein translation, or the up-regulation of protein quality control and degradation machineries including stress specific sets of ubiquitin-conjugation and deconjugation factors as well as alternative proteasome isoforms. 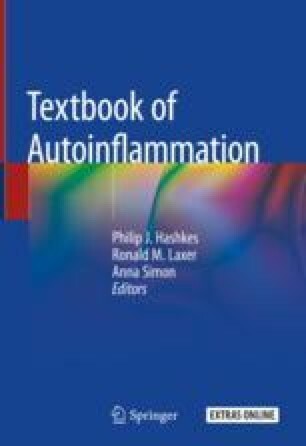 The loss of controlled adaptation and/or impairment of proteasome function represent a hallmark of various proteinopathies including proteasome associated autoinflammatory syndromes (PRAAS) , which are accompanied by oxidative stress and induction of endoplasmic reticulum (ER) stress. A common and surprising feature of such diseases is the initiation of chronic inflammation under pathogen-free conditions through the release of various mediators, particularly type I interferon (IFN). Recent work in this field has highlighted a possible role of ER-membrane located signaling cascades originating from TCF11/Nrf1 as well as the PERK and IRE1α arms of the unfolded protein response (UPR) in this process. Their precise implication in the pathogenesis of proteinopathies as well as their relevance for the design of novel drug targets will be discussed. This work was supported by the German Research Foundation and the Fritz-Thyssen-Foundation.